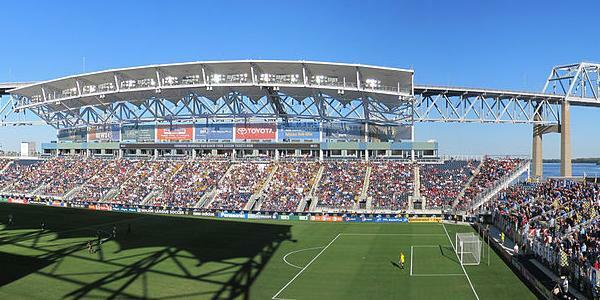 Talen Energy Stadium, previously known as PPL Park, was built as a soccer-specific stadium for Major League Soccer expansion team Philadelphia Union. At the same time it was expected to serve as a catalyst for revitalising the Chester waterfront area. Construction of the stadium started in late 2008 and was completed in the summer of 2010. The first match at the stadium was played on 27 June 2010 between the Union and the Seattle Sounders (3-1). There are currently tentative plans to expand the stadium to a capacity of 20,000 seats, and possibly later to capacities of 27,000 and 30,000 seats. In 2015, the stadium changed name from PPL Park to Talen Energy Stadium following a new sponsorship with utilities company Talen Energy. Talen Energy Stadium is located in the city of Chester, about 15 miles south-east from downtown Philadelphia and 2 miles east from downtown Chester. The stadium lies on the waterfront of the Delaware River, next to the Commodore Barry Bridge. It can be easily reached from the I-95 (which connects Philadelphia with Baltimore). Take exit 4 toward the 322 East/Commodore Bay Bridge and next the exit for Chester Waterfront. The club operates a shuttle service that runs from SEPTA regional train station Chester T.C. to the stadium. You can take a train (to Wilmington or Newark) from 30th Street Station in downtown Philadelphia. Shuttles run from 4 hours before the match and after the match until everybody has left. Tickets for Philadelphia Union games can be bought online, by phone +1 800 298 4200, or at the Ticket Office at the stadium. Ticket prices range from $25.00 for a seat behind the goal to $150.00 for a field seat. Philadelphia regularly sell out and one is therefore advised to buy tickets in pre-sale. Philadelphiaunion.com – Official website of the Philadelphia Union. Visitphilly.com – Official visitor site for greater Philadelphia. Septa.org – Public transport information for the wider Philadelphia area. Been to many games here: Beautiful stadium in a rough part of town, the goal of revitalizing the area has not been achieved. Fans come to the game, then they go home, there is nothing within walking distance to the stadium to do. The River/Bridge views from the West stand are beautiful though. There are hardly sell-outs (except for USWNT games), that definitely needs to be updated in the description. The parking here is atrocious, I’d recommend parking at the Church lots across the street from the Stadium, it’s cheaper and doesn’t take 30+ mins post-match to get out, and the “attendants” are always super friendly. Overall a nice MLS experience, it’s just a shame the stadium is so far from the city and in a bad part of town. There are typically lots of pre-match activities for kids and adults outside the stadium. Decent beer selection, food (like all Philly sports) is average and over-priced.